Spring is on the horizon and that means a bountiful harvest here in Adams County. Our Executive Chef, Joseph Holmes, has been hard at work over the past months creating new dishes for the One Lincoln menus full of fresh, local ingredients. The menu features classical dishes as foundations with modern twists. 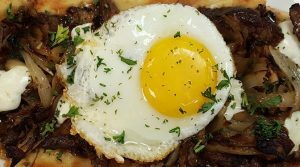 For example, a simple flatbread is elevated with braised short ribs, caramelized onions, and a sunny-side-up egg. 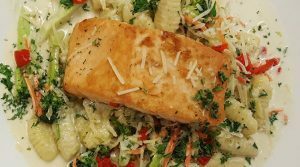 A traditional haluski has been upgraded with seared salmon and gnocchi. Our early morning guests will also be delighted to see some updates to our breakfast menu. Pancakes will now be offered with a few new enhancements including Adams County apple, mixed berry, and black and white which uses white and milk chocolate chips. While the famous Bananas Foster French Toast will remain, there will be other options offered like a fig preserve and mascarpone stuffed French Toast as well. Read more about the inspiration behind Chef Holmes’ new menu here.